Pamela Pitts! Congrats Pam, and thanks for entering. Your fun prize (it really is fun) will be on its way to your mailbox shortly. Enjoy, and thanks again for checking us out at TV Screener.com. And everyone, keep checking our WIN THIS! section … we’ve got lots more TV goodies coming your way! It’s an inside job! What better way to wile away the eight months until 24‘s eighth season premieres than playing Jack Bauer yourself, with the new CLUE: 24 edition board game? The plot: The U.S. is about to be hit by a major attack, and it’s going to originate from inside the CTU office in Los Angeles. Your mission, as board game Jack: Ferret out who your traitorous colleague is from amongst the six agents locked down inside CTU. Jack, the Director of Field Ops, is locked outside, and must communicate with the agents locked inside, via his PDA (that magic Jack PDA!). Green, Plum, Colonel Mustard and the other suspects in the original Clue game are replaced with Audrey Raines, Bill Buchanan, Chloe O’Brian, Mike Doyle, Nadia Yassir and Tony Almeida in the 24 version, and players have to figure out which one is the mole, what kind of attack is being planned (represented by nine pewter tokens, including an airport tower, a CTU badge, a bus, a power plant, a Wall Street sign and a satellite) and from where in CTU it will originate. 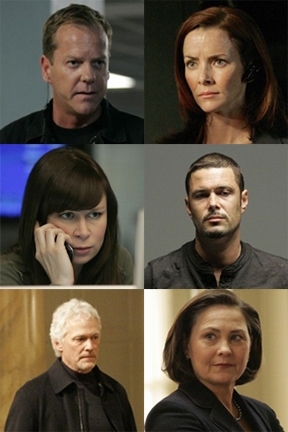 So, think you can expose the enemy and save the world, just like Jack Bauer? All you have to do to find out is leave a comment on this post, telling me who’s your favorite 24 character (besides Jack), and an e-mail address or Web/blog link way to reach you, and you may be a winner. Good luck, my fellow Jack Bauer devotees! Filed in 24, WIN THIS!